Nancy, Beautiful and also the prayer. Amen and Amen! Janet, you have been a work of art for a long time! No waiting for the decades to march by for you! Thank you for your example and influence in my life. 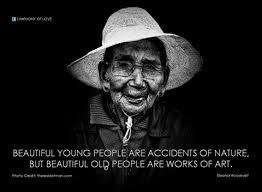 The older I get, the more I understand true and deep beauty:-) Thanks for your very true words. Indeed, true and deep beauty is so much more valuable than the skin-deep variety–valuable to our own souls and to those around us. Thank you for stopping by and commenting, Bernadette! Want to thank Steve for the beautiful way he prepared the way for Jerry & Lisa, and us ,we are so blessed. Thank you Pastor Steve. Praise God for his continued blessing upon FUMC Hudson! We look forward to hearing good reports of His continued work with and through you all. I will pass on your gratitude to Steve. Thank YOU for encouraging him! Thank you for this ‘aging gracefully’ lesson. You’re welcome, Rita. I’m honored you found the post meaningful. That’s a wise and loving attitude to take–honoring the elderly as our treasures. We do indeed have much to learn from their experience. Thank you, Jean! Wow and wow. This post is rich in content and truth. My take-away is to be more focused on the inward appearance and bestowing a positive influence on people than on the outward appearance. Loved the compare and contrast of art/masterpieces vs aging. I’ll share this with you: I rearranged some of the pictures, etc. on my kitchen walls this year. In particular, I moved a mirror from the left side of my archway to the right. The purpose of this tiny mirror is to do a quick check on my appearance before I leave the house. I’m ashamed to say that I catch myself and am surprised at the number of times that I must ‘check’ my appearance by force of habit and find the mirror not where it used to be. Shame on me! Not for forgetting the mirror’s location…but for worrying about the outside more than I should. Getting older physically is a kind of shock when it should be more of a new way to grow in Him. Oh, yes, we would do well to concern ourselves more with our hearts rather than our outward appearances. But! I don’t think we need to forego a bit of makeup and the fixing of our hair. I suppose balance is the worthy goal. And I very much agree with your last comment about getting older being a shock, but also providing new opportunities to grow in him. Absolutely, Cheri! I am in the December of my life and all I can say God gives us younger, older ones “Wisdom.” Sometimes I say it would be nice to experience life backwards and know what we know as we got older. (chuckle) Thank you Nancy, miss you. Blessings. Are you sure you’re in the December of life, with all that springtime energy? I don’t think so! Where we do agree is on the idea of living backwards, to take advantage of what we know now, back when we NEEDED it! I wonder why God didn’t do it that way?! Miss you, too, my friend! And may your blessing (gratefully received!) now bounce back to you! I agree about living life backwards. Retiring at the beginning when we still have the energy and health to enjoy it to its fullest! LOL!!! …and somebody else to handle the responsibilities, pay the bills, etc! Great! Thanks for the link. And I LOVE the quote by Ms. Ellie!! Again, the beautiful young people are accidents of nature, but the “beautiful and quiet spirit” is some slow disciplined process! Thank YOU, Dawn, for taking time to read an extra post. Isn’t that an inspiring quote from Ms. Ellie? (Love your nickname for her!) I’m still praying for God to continue working on me, so I can become that beautiful work of art even as I age! AMEN for both of us!